I've never been to Shanghai so I can't rely on my personal experience, but from what I hear, this Chinese city doesn't necessarily smell like a Guerlain perfume. It doesn't really matter: it's not like Guerlain London (Les Voyages Olfactifs 04) was a real evocation of the city, and neither is Guerlain New York. The Les Voyages Olfactifs line is just another way for Guerlain to bottle and sell a fragrance with a more modern image than the classics, while still maintaining their identity. To my nose, Shanghai smells the most Guerlain-like in the series. Star anise, iris and almond are the first things I smell upon spraying Shanghai. Naturally, my first thought was about the inspiration that obviously comes from L'Heure Bleue more than from China. Shanghai is more floral and also lighter in every way: airier, less sweet, and the base is not that much of a patisserie creation, but the resemblance is there, especially in cooler weather. It took me a little while to really like Shanghai. I love my L'Heure Bleue dearly, so I wasn't all that thrilled with the idea of a modern interpretation in a massive bottle. But the composition is very pleasing, and as I said-- it's easily recognizable as a Guerlain, which is a good thing for me. There's some weakness in the base of Shanghai- not as in the opposite of "strength" (the fragrance has an assertive sillage and a reasonable longevity), but in the lack of real creamy sandalwood. Guerlain Perfumer Thierry Wasser did his best with an approximation and fortified it with cedarwood (dry and almost peppery). It goes well with the powdery iris note that seems to be at the core of Shanghai, but some of the exotic element could have used a big dose of the real thing (one can dream). Notes: star anise, orange blossom, almond, cardamom, ylang-ylang, jasmine, iris, mimosa, cedar, patchouli, vanilla and sandalwood. Guerlain- Shanghai (Les Voyages Olfactifs 05)- $215, 100ml (yes, they changed the bottles of the series and reduced their size) is available from select locations. Right now it's at Bergdorf Goodman, though not available online. 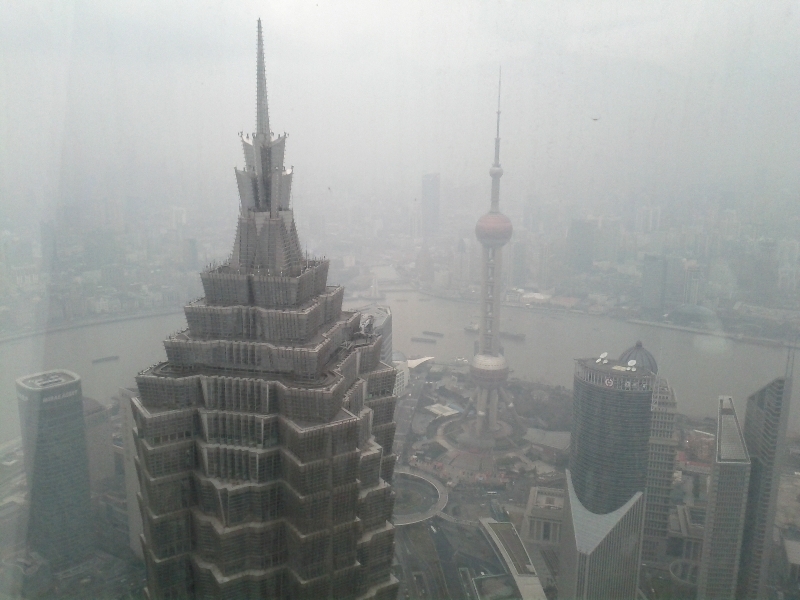 Photo: View from the lobby/lounge of Park Hyatt Shanghai by John Ollila. Ah, I was just reading about Guerlain Shanghai this weekend. If this is not a "strong" scent but one with excellent lasting power, that would make sense to me. In general, strong, spicy, and/or rich scents (which I often favor) would not appeal to most of the women there who have a different fragrance beauty standard. My mother (who is Shanghainese) would probably say Shanghai is more of a classic Chanel. She thinks Guerlain fragrances try too hard. I disagree, but I think something in the Guerlain base just does not work for her.